In 2004 the National Institute of Standards and Technology conducted SlapSeg – the Slap Fingerprint Segmentation Evaluation. 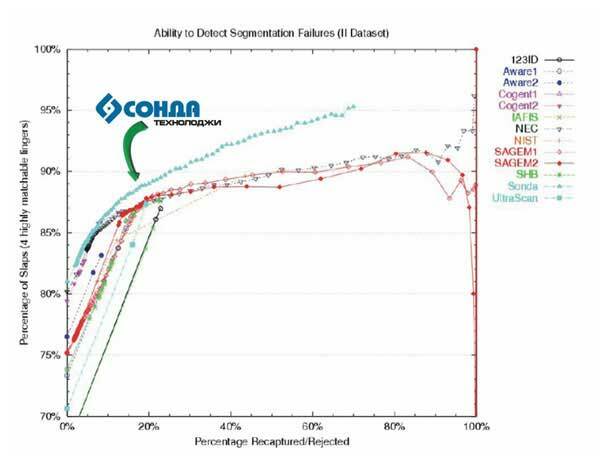 The SlapSeg testing estimated the accuracy of algorithms for fingerprint image segmentation. In addition, this test allowed to use the international ANSI/INCITS-381 standard in WSQ or RAW formats for fingerprint images processing. The Sonda algorithm showed the best results on the database of hard fingerprints. So as for fingerprints of good and perfect quality Sonda was among the top three leaders. As a result Sonda entered the top three along with such companies as NEC (Japan) and Sagem (France).